Phase-shift keying (PSK) is a digital modulation scheme that conveys data by changing, or modulating, the phase of a reference signal (the carrier wave). 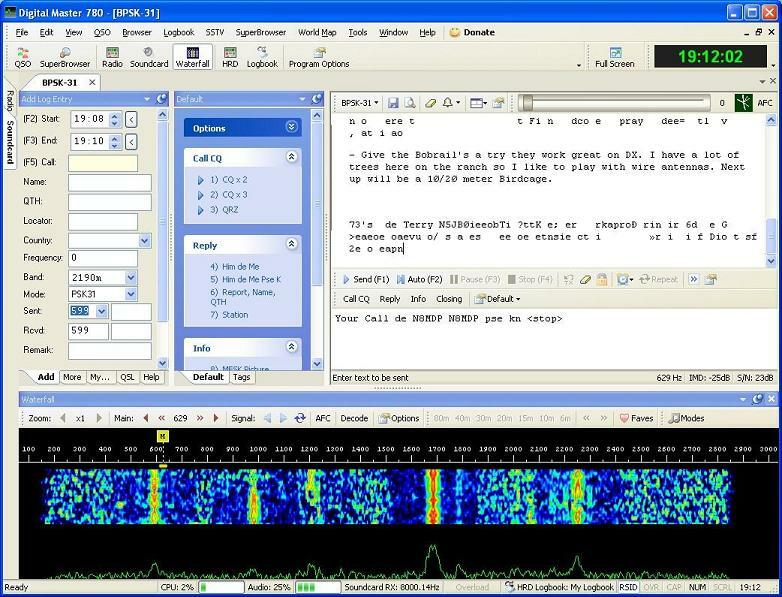 The image above is a screen capture of DM780 capturing a PSK31 QSO. 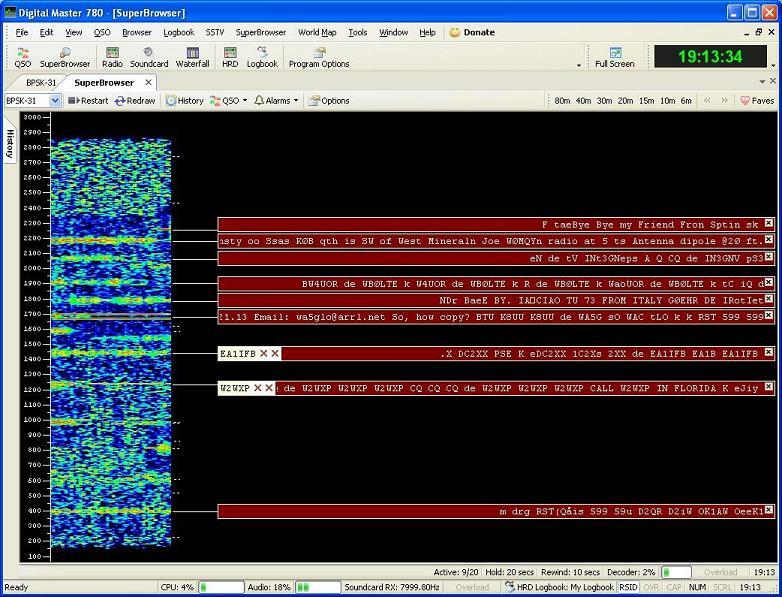 The screen shows the typical PSK transmit and receive windows, but more importanlty, the "Waterfall" plot. The watefall plot is a very useful tool because it represents a graphical window that allows you visualize the station that are active and transmitting within a 31 kHz bandwidth. The stronger signals have the brighter colors, while the weaker signals will not be as bright. Using the waterfall graphic really is what makes PSK31 operation easy to tune and enjoyable to work. All that is really needed to run PSK31 is an HF radio, a computer with a sound card, an interface that connects to the PC and the transceiver such as a RigBlaster or a homebrewed audio coupled solution and Ham Radio Deluxe. Another neat feature built into DM-780 for PSK31 is the 'Super Browser'. A picture of the Super Browser is on the right. It allows you to see all on-going conversations and calls, and easily connect or join in by simply clicking the red test string of the station you wish to contact. It works by simply turning the waterfall up on it's side, and decoding each individual data stream...all at once! I find this very useful for quickly spotting a station that I might want to call CQ to. There is a great tool available for looking for PSK contacts and that is from Hamspots.net. 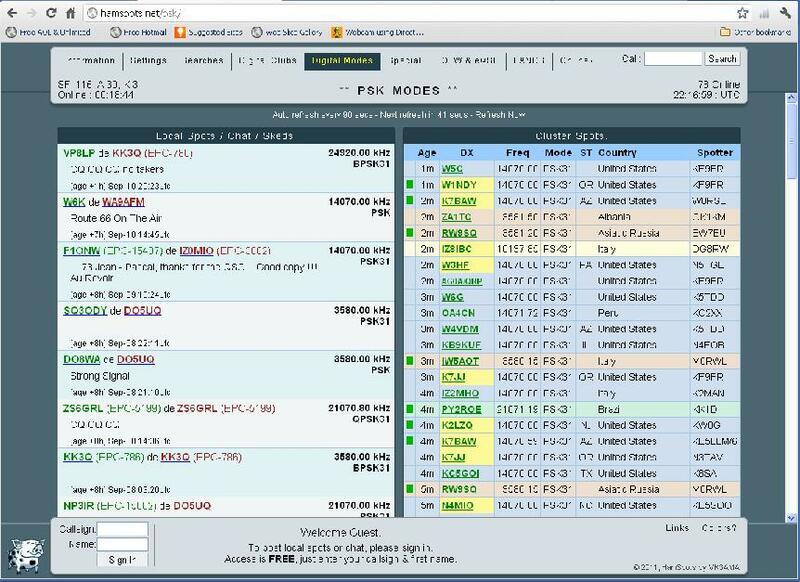 They offer a great tool that allows you to see PSK spots that have been found by other operators.